RawSpiceBar is a monthly spice subscription box perfect for people who love to experiment with new flavours and cuisines. Every month, subscribers receive three hand-picked, small batch, freshly ground spice blends to create three delicious dishes. Don’t worry, the recipes are included in your monthly spice box! RawSpiceBar has partnered with award winning chefs to create mouthwatering globally inspired meals for your family to enjoy. A subscription is a great way to break out of that common dinner rut many of us know so well. Try one month for just $8 with free shipping! You’ll receive a discount if you subscribe for a longer period of time. Yearly subscribers can get 12 months worth of spices for only $6 a month. Looking for a unique holiday gift for a foodie or the person who has everything? Buy them a gift subscription! Use the coupon code flavor6 to receive $5 off a six or 12 month subscription. Visit RawSpiceBar to learn more and to purchase. Happy cooking! I like that they have spices I wouldn’t normally buy. I love to try new things but spices can be so expensive. Recipe cards are included in the subscription. I learned that the theme of the December box is Iceland and that it includes licorice sea salt! What a flavor. I like their wide variety of spices. I like that they also come with recipes. I like that you discover the flavors of a new region each month. I like that the kit comes with recipes. I like that everything is freshly ground. I would love to try the pink peppercorn blend. Anything fresh and tasty would be good. That for just $8 you can have a small batch of freshly ground spices shipped right to your front door. I learned that their spice blends are created by top chefs from around the world. 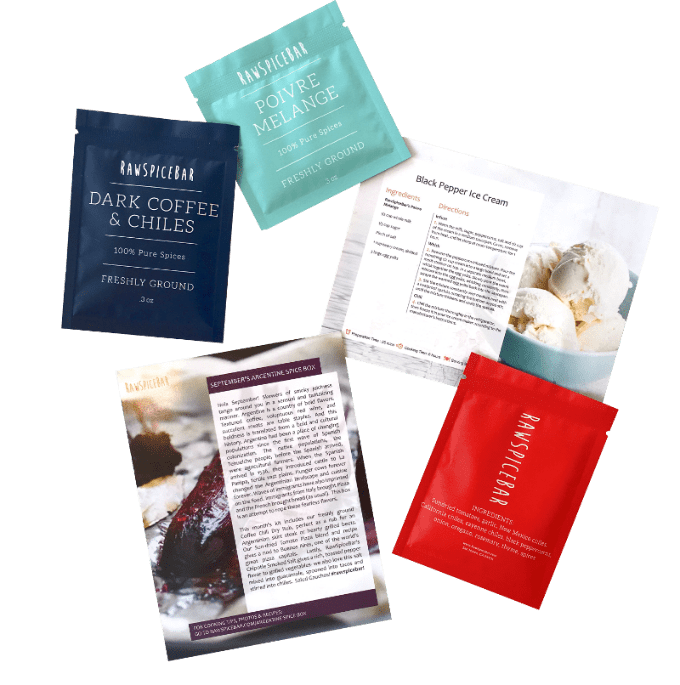 Each month comes with 3 different flavor kits and recipes to give you a chance to experience new flavors! I learned and love that there are flavors from a different region each month. I like that they bundle spices by region.